Many times people ask is it compulsory to place order every month in Oriflame? Nothing is compulsory in Oriflame. You are your own boss. I think Vimmy's sponsor must have told her to place a minimum order of 2000 probably because you get free home delivery if you live within city limits. I became a Manager in Oriflame quickly after joining because I was following all I was learning from my upline leader. I was following the daily wellness routine and the daily business routine in Oriflame. 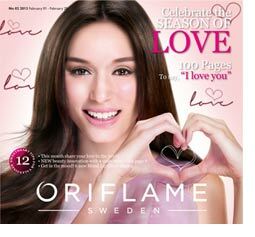 I was circulating Oriflame catalogues in my friend circle and I was recruiting new members in Oriflame every week. I was teaching my new consultants how to do facial at home with Oriflame products. I was getting more money than my full time job so I said good bye to by boss and started working in Oriflame full time. I was writing articles on Oriflame products and was getting good orders for Anti aging products, wellness products and cosmetics of Oriflame. I was also getting lots of request for Oriflame membership from all over India. There were housewives who wanted to use their spare time in making some extra income or to pass their time. There were working women who has lots of friends who were spending on Oriflame cosmetics and there were men who were interested in the best MLM business opportunities in India. Mrs. Jashmi is an Oriflame Senior Manager. She is also an Oriflame Certified Beauty Expert. In April 2011 and September 2011 she received an award for her performance at an Oriflame event in Mumbai. Managing Director of Oriflame Mr. Marcus Sandstorm awarded her the Senior Manager position in a special event in Mumbai. Ms Jashmi Travels all over India to train, coach and develop consultants who want to make it big in Oriflame.